Going Grey and Slightly Green: Another week of heat! As Aussies who watch the news may be aware, Queensland is in for heatwave conditions this week and records are expected to tumble. After our recent very cool weather it is all a bit of a shock but there is no way to escape the heat short of taking a trip to Tasmania, or Canada or Alaska so plans are in place to survive it including a trip to the cinema if it all gets too much. How lovely and cool all that snow looks at the winter Olympics. Strangely enough the Craft Alive show has been held the second year in the row during a heatwave and thankfully I was able to go there yesterday when the temperature was a 'cool' 30C and certainly not as hot as it will be tomorrow at 38C. So this year the hall was much more comfortable with the aircon going and I was able to spend some time with the lady who was demonstrating the technique and I feel more confident now about what to do. 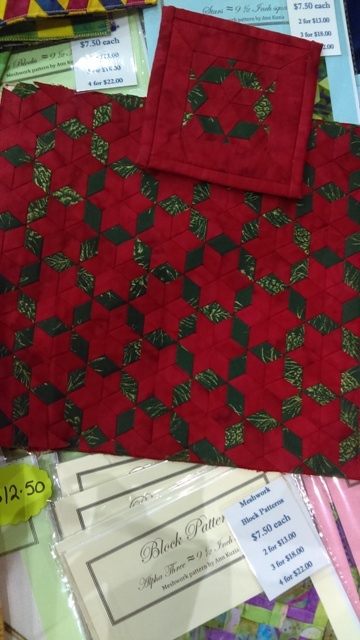 I particularly liked the red and green design above. 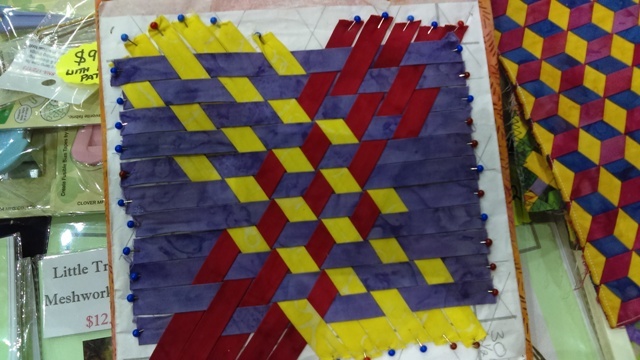 She made a large piece of meshwork and then cut some off to make what could be a coaster. These would make lovely placemats and coasters for Christmas. So now I have no excuse not to make up the two kits that have been sitting with my UFOs for the past year. 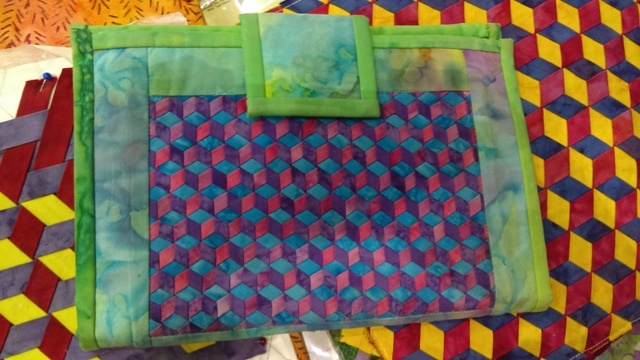 I was determined not to buy much at the show as I have the habit of buying craft items I don't use but I couldn't go pass the Paw Patrol fabric as one of my granddaughters loves Paw Patrol and anything with four legs so I bought 1/2 metre to make something for her. Perhaps a library bag. 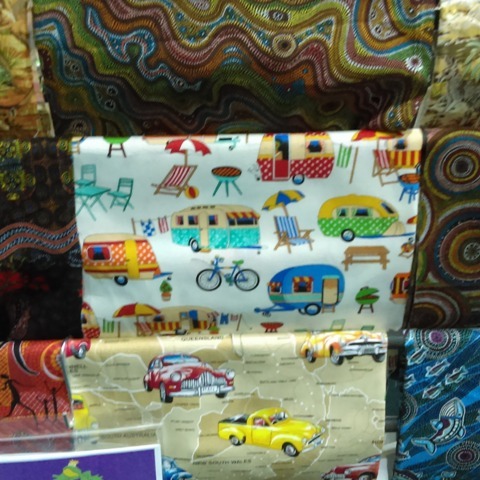 The fabric was on the Whispers of the Valley stand and they have some great Aussie themed fabrics there like the retro caravan one above. If you would like to have a look at their other fabrics they have an online Craft and Gift Store. They also provide accommodation if you happen to be travelling in SE Queensland and they have a B & B near Gatton in the Lockyer Valley about 1/2 hour from Toowoomba. If you have high temps predicted for the coming week I wish you all the best if you don't have aircon like us. I think there will be lots of trips to shopping centres in the heat of the afternoon as we will be in survival mode. Of course lots of readers are looking forward to some heat in their lives after months of snow in the Northern Hemisphere. If only we could do a bit of a swap for a few days that would be nice. LOL! Whatever the weather stay safe and cool (or warm). Mesh work is beautiful. I too like the red and green one. Three color ones are nice too, they have a three dimensional look. Nil, the meshwork isn't hard to do and some of the patterns are certainly three dimensional and look complicated. you know it was hotter the weekend i had my fall, (it was 45`c in my kitchen) though we didn't experience the high humidity we are getting at the moment, which seems to be the offender, not the temps, i mean come on, 30`-36`c is pretty much average temps for Queensland summers & some isolated pocket areas (like us) seem to get very hot at odd times. it seems we tend to run from the heat these days instead of enduring it like we all once did. Meg I hope the drive back home in the traffic isn't too bad as I imagine lots of people headed for the beach this weekend. So glad I went to the Craft show yesterday, the new ceiling fans did a good job but I would not like to be there today, especially after lunch ! I bought a few things there and will show you when we catch up. Movies for me too if it gets too bad . Lordy but it is hot! It is also extremely humid. I dont think we are going to get quite as hot as Toowoomba but it is still YUCK!!!!! At 10.30am it was 32 degrees. It's now lunchtime and the breeze has dropped to nothing. I think it's time to go and wallow in my wading pool. Stay cool Chel. Just another summer week in SEQ. The meshwork looks interesting and the fabrics are pretty, the caravan one wpuld look good as a cushion. Deb, I took the thermometer outside today before the storm hit and it said 40C. Too hot for me. Hope you have got the power back on now after the storm hit down there. Yep, it was inside in the aircon for me yesterday for the bulk of the day, except when I ventured out to do the grocery shopping - thankfully Aldi has aircon too. I left my baking until later in the afternoon. Thankfully the small shower of rain we had (we missed the majority of the storm) cooled things down for the night. I think it will be early morning activities and inside over the bulk of the day for the next week. The Japanese Meshwork looks lovely, sadly I'm not very crafty, so will just admire what you show us on your blog. Considering we got to 44 degrees Celsius, last summer, I think 42 degrees, today was fairly tame. It's insane, when we start normalising temps over 40 degrees! But that seems to be the trend with summers now. I wouldn't mind it so much, but its the lack of rain and the long stretch of hot days, that makes everything even hotter! On the plus side, we're on the waning daylight hours, of summer. Meaning there's less hours in the day, for the sun to be up. So it gets cooler, quicker. Last summer it was still hot after 5pm, because the heatwave coincided with the longest days of summer. Winter can't come quick enough though, lol.